Looking to relax and get away from it all? 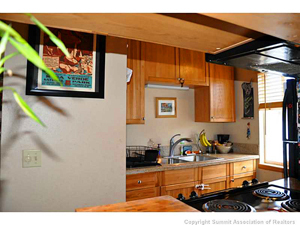 Then I have the perfect Breckenridge, CO condo for you! This in-town property is located on the top floor at the southwest corner of its building, which means you’ll have plenty of privacy and amazing views of the mountains out your window. Although this is a 1-bedroom condo, the layout and space available to you will make this property feel much bigger than the bedroom count. With an updated kitchen and bathroom, you’ll find this large corner unit has plenty to offer. On top of everything else, you’ll enjoy a 2-minute walk to the Gondola. That means you don’t have to go far at all for a fabulous day on the slopes or a summertime hike. Since you’ll be right in downtown Breckenridge, you can easily enjoy all the fantastic, locally-owned shops and restaurants nearby. Whether you’re looking for your first home or you want to purchase a vacation property, this Breckenridge condo has it all. From breathtaking, mountain views to elegant, understated renovations I can’t recommend this home highly enough. It’s simply a gem! If you’re interested in checking out this delightful Breckenridge, CO property for yourself, just let me know. I can arrange a visit as soon as you’re ready. Give me a call and I’ll schedule a tour that works around your schedule. Also, if you want to view other properties in Breckenridge or throughout Summit County, I’m happy to put together a list of homes that might suit your tastes. You’re always welcome to look through the updated listings on my website at any time, and when you’re ready, we can get together and talk about the particular properties that meet your needs.